I recently found myself in need of a cute travel-sized makeup bag with emphasis on "cute." Since I don't have any makeup print fabrics in my stash, I opted to make a little lipstick foundation paper piecing pattern to spice up the Open Wide Pouch (medium size). This pattern is too cute to keep myself, so I'm sharing it with you all for free! 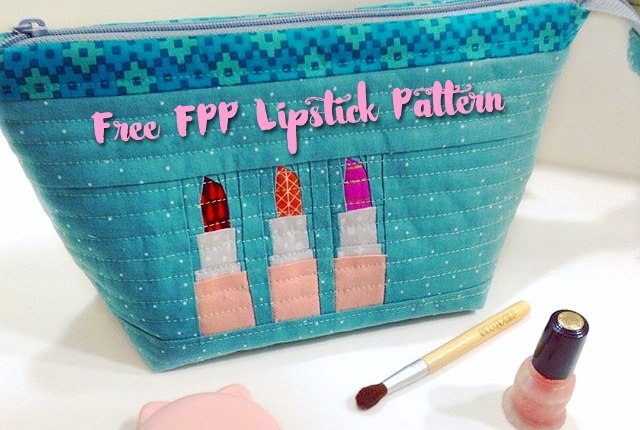 Each little lipstick measures 1" x 3" finished, but the free PDF pattern also includes a larger 2" x 6" size. Alternatively, you can scale the templates to your desired size, and redraw the seam allowances to .25". Cute lil bag! Thanks for the free pattern.